THE RESTAURANT BUSINESS is not for the faint of heart. Finding the right combination of chef, location and space is a dicey proposition at best, then factor in the search for reliable investors and just the right lighting, cutlery, chair fabric and pepper mill design. Even once all those ingredients seem harmoniously aligned, the alchemical result, the ineffable feel of the place, is still nearly impossible to predict. And that's a volatile variable because, ultimately, it's a restaurant's spirit that will--or won't--attract its clientele night after night. This year we've seen start-ups and renovations in unlikely spots, from a clapboard cottage in Newport Beach to a tiny cafe in Venice. And the food itself? Forget those L.A. cliches about sprouts and avocados. Food-o-phobes are the latest cultural outcasts, and the pleasure principle is back in the diner's seat. These days we're lustily tossing back everything from shooters of seaweed and mountain yam to thick steaks and porcelain cups of pot de crime. It was no easy task to pick L.A.'s 10 best new restaurants. The criteria aren't quite quantifiable; we've eaten, and eaten--and eaten some more--and these, in no particular order, are our favorite places. JON FERNOW, PATINA'S CHEF FROM 1993 TO 1996 and a partner with Joachim Splichal in the Patina Group, joined forces with Rainer Schwarz, ex of Cafe Pinot, to pick up Victor Drai's lease on La Cienega Boulevard when the latter decamped for Vegas. Once in, they banished all things leopard, lost the potted palms and loud pictures and lightened and brightened the walls. That back room, the one that had indoor-outdoor carpeting, has been overhauled with whitewashed bricks and a fountain, and the sunken cocktail lounge now has playfully colored outsize furniture. The result is just the right foil for Schwarz's incredible American-infused French cuisine. Or maybe it's French-infused American. Suffice it to say, "It's not your typical bistro style that everyone else is doing," according to Schwarz. "It's very simple; nothing crazy like tomatoes in the middle of winter." This is a grown-up spot, and the crowd leans toward older Spago and Patina types whose lunch money dates back a few years--or at least they know how to make it look that way. They also know their osetras and prime beefs and don't want any gauche nouveau tricks. Or, as GM Allan Ludwig, who recognizes a lot of the crowd from his days at the Grill, puts it, "Our guests have the money to go out five and six nights a week. They want good service, and they love to be recognized. When fads change, they don't; they won't leave us when the music changes." 730 N. LA CIENEGA BLVD., 310-358-8585. "IT'S SO TACKY!!" CLAIM CRITICS. EXACTLY! "What were they thinking?" Who cares? The old Scandia, the landmark restaurant where Bogey had his own stool when iceberg lettuce with Thousand Island dressing was in vogue, has been restored to the tune of $4 million. In 1995, the original owners Gregg and Scott Rennick bought the building back from Don Cornelius, the Soul Train man. The work of interior decorator Danna Moore has raised a few discerning eyebrows, but for anyone with a modicum of humor, this is a fabulously campy spot. The bar is dark and delightfully kitschy, with a series of mismatched fabrics bound to stir lively conversation even in the dullest of dates, and the wraparound windows and greenery in the terrace room make it a nice spot for lunch. The $35,000 fake palm tree in the main dining room pegs this area, lined with comfy banquettes, as our personal favorite. Unfortunately, the Rennicks' new partners, club promoters Steve Scarduzio and David Klass, might jettison the fixture, which changes colors as you dine, in an effort to turn Legacy into a happening late-night spot. "I guarantee this is where all the in celebrities will be hanging out," says Scarduzio. No doubt they'll like that private dining room in the wine cellar. Legacy hits its highest note in the kitchen, where David McMillan, formerly of the Peninsula, is turning out delicious food, like the tenderest of pot-roasted pork served over creamy polenta and a rack of Australian lamb with sauteed artichokes and brioche bread pudding. Jean-Claude Canestrier, ex-pastry chef for Prince Rainier of Monaco, makes desserts--like a lemon parfait with a rosemary meringue and blackberry coulis--appropriately regal. 9040 SUNSET BLVD., WEST HOLLYWOOD, 310-550-6299. THIS ISN'T A NEW RESTAURANT, AS ANY serious foodie knows, but it recently reopened after owners Tim and Liza Goodell, chef and pastry chef respectively, spent 18 months renovating. Now their backstreet house in Newport Beach, with three dining rooms and two outdoor patios, has reclaimed its mantle as one of the most exquisite dining experiences around. The staff is smart and professional, and the taste of the place is impeccable--Tudor red walls, white linen tablecloths, Riedel crystal. 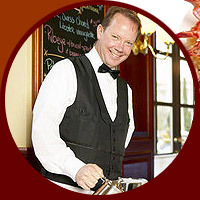 As for the taste of the food ... let's just say the Goodells, who also own Costa Mesa's Troquet, have a complete understanding of the palate's appreciation for subtlety. Consider the delicate nuance of cucumber-infused granitee atop a Wellfleet oyster, for example. Or the wild black bass with tomato confit, chorizo and a basil emulsion. Dessert might include a knockout Valrhona chocolate souffle cake with prune and armagnac ice cream. In fact, the only trouble with Aubergine is that it's so far away for so many of us. But the Goodells, ultimate hosts that they are, realize the imposition and are hunting real estate in L.A. proper, 508 29TH ST., NEWPORT BEACH. 949-723-4150. LOOP SOUTH, SANTA MONICA, 310-313-0977. THE TOO HOT TAMALES HAVE DONE IT AGAIN. At Ciudad, Mary Sue Milliken and Susan Feniger have renewed their passports as intrepid intercultural trendsetters with a wildly inventive menu that showcases the tastes of Central and South America--and gives a big nod to their alcohol culture, with festive cocktails and a tasting menu of more than 30 rums. The environment, designed by Milliken's husband, Josh Schweitzer, is just plain happy--Klee-like murals on the wall, friendly waitfolks in mango-colored guayaberas. The food's fun, too--big platters of intriguingly spiced, soul-sating stuff. "We're not into elitist food," says Feniger. Or elitist locations. "When we opened City on Melrose in 1981, there were just a couple of furniture refinishers and Wacko," she says. When they opened a second City on La Brea, "it had two art galleries." Both streets are now, of course, culinary and shopping meccas. Ciudad, another smart choice, is smack-dab in the middle of once-dead downtown and a stone's throw from the Mark Taper and the soon-to-open $350 million Staples Entertainment Center. "We look at [so-called] A-plus locations, but there's no risk," says Milliken. "I don't know if it's boring to us"--"or if we're too cheap," finishes Feniger. Maybe just savvy. 445 S. FIGUEROA ST., 213-486-5171. CAROLINE STYNE WAS THE manager of Jones Hollywood and a friend of a friend of Suzanne Goin, who was souschef at Campanile, when they were set up as potential restaurant partners. "We dated," jokes Goin, "and the more we talked, the more we realized we had the same ideas about the sort of place we wanted to open." The two foraged for a fleet of investors and finally found a prime location--on Melrose between Ago and Jozu--to call their own. Now Lucques, which is named for a French olive whose skin tone is reflected in the restaurant's palette of subtle colors, is one of the brightest jewels in L.A.'s restaurant scene. Goin, a Food & Wine cover girl, gets tongue-tied when asked to define her style and wishes somebody else would do it for her. "A melange of French and Mediterranean with a soupcon of Californian that's sophisticated and, somehow, feminine" would be one way to go. Another would be "really, really good." And the atmosphere, thanks to Styne's friendly presence, is clubby in a non-snobby way. Lucques is a great spot for long, wine-fueled evenings of conversation--over bouillabaisse or a nice little saddle of lapin, perhaps. And with its wonderful pasta and wine selections, the bar menu, served until 10:30, is one of the best deals in town. 8474 MELROSE AVE., 323-655-6277. WHEN BURT ALEXANDER, JERRY GARCIA'S extant doppelganger, lost his partner in a little beachside joint called Frankie and Raider's, he called Sandor Kaplan, his cousin's son, and asked if he wanted in. Kaplan, who'd just opened Pasadena's Pinot, in turn asked Michael Wilson his best friend since age four and a fellow cook at both Pinot Bistro and San Francisco's famed Rubicon--to join them. Together, the team transformed the 14-table cafe into the most unlikely spot on the Westside to serve finger-licking fancy food. The menu, which is recited by the waiters, changes weekly, and its cuisine is not to be pinned down. "We've been calling it nouveau California," says Kaplan. "But it has European and Mexican influences--and we have pickled ginger in the Caesar. So it's really nouveau cuisine for the new millennium." Edibly, that means things like seared monkfish served on a lemon confit-infused potato cake, or porcini gnocchi with an asparagus phyllo roll. And folks who've never seen that part of Venice before (you'll know them by their high hair and are happily rubbing elbows with the locals to enjoy it. 5 DUDLEY AVE., VENICE, 310-399-6678. HOW OFTEN DO you get to spend $40 on a 16-ounce prime New York steak? Rarer still, how often does the meat actually seem worth it? Bruce Marder, the man who brought you Rebecca's, the Broadway Deli and the West Beach Cafe (rest its soul) in Venice, makes the deal seem close to a steal in his most sophisticated venture to date--well, he lessens the sting at least. With partner Steve Wallace of Wally's Wine Shop, he scored a real estate pearl, formerly disguised as the Mucky Duck, and transformed it into a small, elegant room with a shiny wooden ban He took a three-month cooking course in Italy before manning Capo's stone fireplace, where he grills top-tier meats for a top-notch clientele. The kitchen turns out the rest of a smallish, nicely balanced menu featuring herbs and vegetables from Marder's own garden. And a flock of handsomely chiseled waiters--no runners or busboys--keeps the operation humming along smoothly. "I've decided I like designing restaurants and cooking," says Marder, whose current holdings suggest a shrewd Monopoly player. Next, he's reincarnating the West Beach at the Pacific Shores Hotel across the street, and in September he'll reopen the Brentwood Inn as a "small watering hole for the local elite." 1810 OCEAN AVE., SANTA MONICA, 310-394-5550. LIZA UTTER, WHO OPENED AND CO-OWNED La Cachette in its glory days, wanted an "East Coast meets West Coast" beach feel for her new spot, so she painted the walls white, hung shutters to separate the bar area--a resort destination of its own with overstuffed chairs and sofas--from the dining room, put in plenty of windows and lined the entryway with exuberant black-and-white snaps of herself and her friends. The menu started off matching the decor: steamers, lobster, corn on the cob. But with Josie LeBalch masterminding the kitchen, it has evolved considerably. Hence the amazing baby-tomato tart lined with goat cheese and fresh herbs and the New Zealand lamb chops with fennel potatoes and red-wine sauce. Desserts are gracefully sybaritic: miniature apple pies, fruit cobblers served in cereal bowls and Liza's fantasy sundae, which includes vanilla and chocolate ice creams, chocolate and butterscotch sauces. The Beach House is like one of those nonlinear equations; the whole is even greater than the sum of its parts. The place has an electric feel, thanks in large part to the engaging Utter, who grew up in Malibu and the Pacific Palisades and seems to know everyone in the joint. In fact, everyone seems to know everyone. "When people walk in, they say they feel as though they're at a wedding," Utter laughs. "When we're busy, it's like a giant party and the guests are working the tables." 100 WEST CHANNEL, RD., PACIFIC PALISADES. 310-454-8299. We at LOS ANGELES MAGAZINE know how much you love to eat out. So, In our March 1999 issue, we asked you to name your favorite restaurants in the city. Here they are, Congratulations to all seven winners. COPYRIGHT 1999 Los Angeles Magazine, Inc.